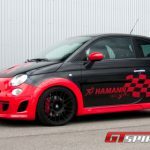 At first glance, the Fiat 500 Abarth and its powerful sister the esseesse would normally not really seem to fit into the Hamann-Motorsport program. 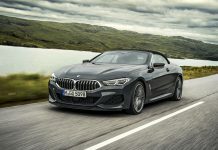 But the company based in Laupheim, Germany decided to add the Italian city car to its line-up of brands – next to BMW-models and exclusive luxury cars – making it the first tuner to offer upgrades for the little Italian. The Germans offer an extensive range of upgraded kits for the Cinquecento which improve the characteristics Fiat has blended into one package; aggressive looks, sporty driving, and everyday usability. Looking back into the heritage of the Abarth brand, we come across Carlo Abarth, Fiat’s tuner of choice many decades ago. The brand is owned by Fiat now and acts like an Italian version of AMG or BMW M Power. The 500 Abarth’s closest comparison, in spirit and in dimension, is the Mini Cooper S. Both are enthusiastic, turbocharged versions of a cheaper volume subcompact, hatchback with front wheel drive. They are relatively close in terms of overall packaging and size, although hardly identical in personality. At only 140 inches long, the 500 Abarth is the type of city car that loves city traffic, especially with the turbocharger providing an extra 35hp of power compared with the naturally aspirated 1.4 liter in the standard 500. The Abarth’s ready-to-play nature asks you to floor the gas pedal at every opportunity and feel the steering wheel wiggle as the front wheels scramble for grip. 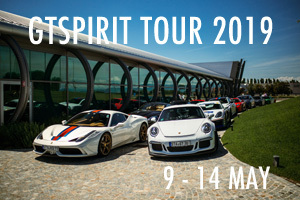 The area near Laupheim in the South of Germany close to Ulm was the venue of our road test. 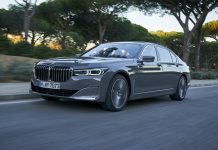 The twisting country roads are also used by one of the biggest German car makers from Stuttgart. Mercedes uses the area to test drive their latest models. Hamann supplied us the keys to a fully packed Fiat 500 Abarth Largo, which included every single option available within the Hamann price list. We entered the vehicle with one single question; where did the ready-to-play nature and personality receive some additional flavor? The standard setup of the Fiat 500 Abarth and 500 Abarth esseesse – a 1.4 liter 16 valve T-Jet engine producing 135bhp or 160bhp – can be enhanced by a range of five performance packages. The stock output is 206Nm or 230Nm of max torque for the esseesse. The smallest upgrade HS1 boosts the Abarth up to 160hp by applying some well-directed changes to the engine electronics. The torque rises to a strong 285Nm. The next upgrade HS II pushes both versions to 180hp and 295Nm torque. 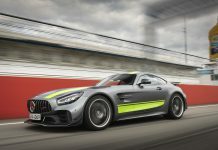 Software programming, a modified exhaust turbo charger, an optimised air filter case with sports air filter as well as a twin-pipe muffler are the ingredients. 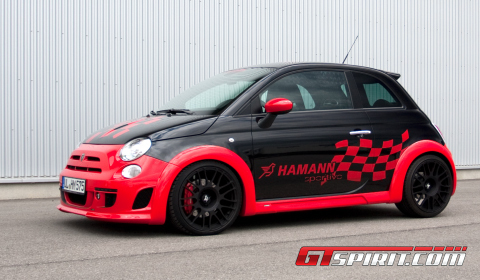 But Hamann even goes one step further with the performance kit HS III which renders 210hp and 310Nm. 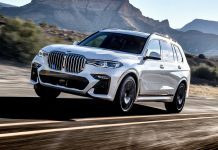 This can be attributed to a new turbo charger with smaller geometry, a new fuel supply and an optimised engine electronic. Normally the range of packages would end here. Just some minor changes to the technical setup of the car combined with an ECU upgrade, but Hamann has more to offer. 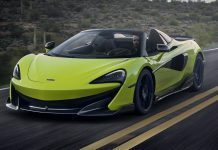 The HS RACE program includes forged pistons, enhanced connection rods, a modified turbo charger with charge air cooler, a race clutch with weight-optimised one-mass flywheel and a new control electronic – altogether this renders 240hp and a torque of 330Nm. For optimum deceleration, there are sport brakes with a four-piston calliper and 264mm or 305mm large brake discs outfitted to the little Italian. 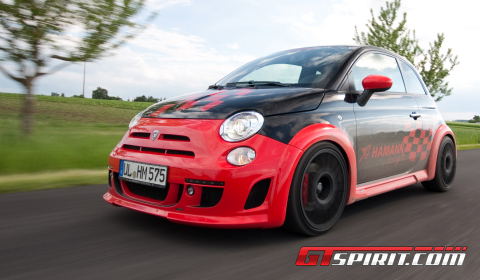 The final package is the astonishing HS CINQUECENTO 575 program. 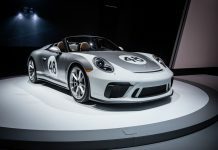 Compared to the HS RACE, it also contains a re-engineered cylinder head with adjusted camshaft, two charge air coolers as well as a self-locking differential. This leads to an impressive power output of 275hp while the torque is catapulted to 380Nm. Other options which are added to the package include a sport exhaust system and an alteration for the manual transmission. 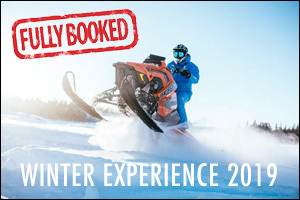 The system includes an end muffler with four round stainless steel pipes, a pre-muffler with a metal catalyser and a sport manifold. By applying a longer fifth gear, the engine rev is decreased by 500rpm which allows a higher top speed. Customers can also order a self-locking differential which allows a locking capacity of up to 50 percent and therefore significantly increases the traction. 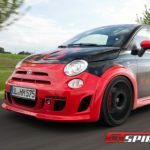 If requested it is possible to add the last two options to the standard Fiat 500 Abarth esseesse performance kit. The Largo brand name stands for the program which holds the aerodynamics components, flag decals on the car itself and the newly developed wheel set. The trendy Italian shown here was outfitted with the full package. At the front you will spot a re-designed front skirt with integrated LED-lights. Special wing extensions are added at the front and the back. They widen the car body by 30mm at the front and 35mm at the rear axle. Both are linked by newly developed side skirts. At the redesigned tail the four exhaust end pipes and the diffuser are outfitted to the vehicle. The Largo Forged Anodized wheel set provides a sporty look to the vehicle. The black matt anodized, one-part rim is offered in the size 8.0×18 (front axle) and 9.0×18 (rear axle). The German tuner outfitted the rims with tyres in the dimension 215/35 R18 or 225/35 R18. Additionally, the cast rim HM EVO is available upon request. Another enhancement regarding the handling of the car is the Hamann-coilover suspension which lowers the car´s centre of gravity by up to 60mm. The inside received only minor enhancements. An aluminium pedal set including foot rest and a floor mat set with embroidered Hamann logo are added. The standard setup of the Abarth combines sportiveness with a comfortable atmosphere of an Italian power city car. The sport seats are supporting on longer trips and offer enough grip while taking fast corners. The ergonomics are sufficient for easy gear changes and hand brake corners. The overall ride of the Hamann Largo is similar to the original setup offered by the Italians. Like the Mini, the cinquecento Largo has charisma in spades. The handling of the suspension is a bit firmer and more bouncy as stock, but overall the cars feels more glued to the road than the standard Abarth. There’s still plenty of understeer though and the steering still does not feel as pure as you would expect it to be. Gaining velocity is not something you will struggle with, the Largo has gained more speed and a 0.2 seconds faster sprint time to 100km/h. The gutsy sounding 1.4 liter turbocharged unit gets an improved soundtrack and feels very flexible, which, given the sometimes clumsy shift of the five-speeder, is one of the most important characteristics of the Largo. Credit for the speed and agility is partly due to the car’s scant 900kg curb weight. In the end there really is no cheaper way to make yourself smile behind the wheel of a new car at the moment than a ride in this hotted-up little Italian with some additional German flavour. The Largo Fiat 500 Abarth is not a car that can be driven with your fingertips. It is an entertaining small car with an even bigger performance. Its unique appeal, improved responsiveness and cheap thrills make the Hamann Largo a one-of-a-kind sports car capable of bringing a smile of any enthusiasts face.